An unusually cold January didn't stop a crowd from assembling to see and talk about Macworld San Francisco 2003 at the General Meeting. As expected, Apple had new goodies to show off. 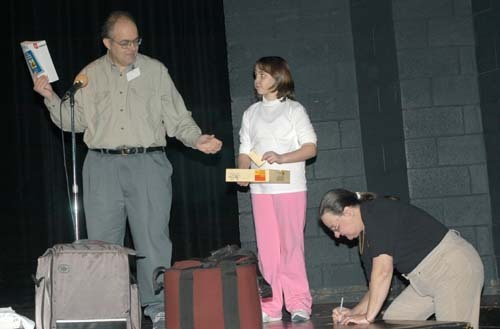 In line with recent practice, however, none of the goodies were exactly expected. In fact, Apple's recent product introductions have been cloaked in the deepest secrecy, helping create a large and vibrant rumor and gossip industry. Rumors on the Pi's computer bulletin board, the TCS, suggested there might be faster "tower" Macs, that formerly free applications such as iPhoto and iTunes would now cost real money, that Apple would be introducing its own digital mobile phone, that Apple would introduce its own personal digital assistant (or possibly sell a Palm PDA with an Apple logo), etc. While there were some near misses, nobody proved to be particularly clairvoyant. Steve Roberson used Apple's new Keynote presentation package to make a slide show of upcoming Washington Apple Pi events. Apple Senior Engineer Brian Wayman then took the stage to provide Pi members with a hands-on demo of some of the new offerings. 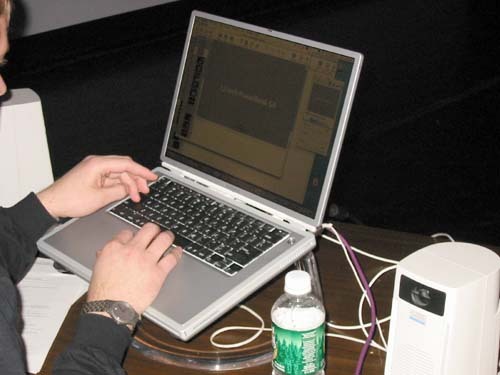 Using an "old" PowerBook G4 running at a relatively modest 800 MHz, he used Keynote to, among other things, demonstrate Keynote. 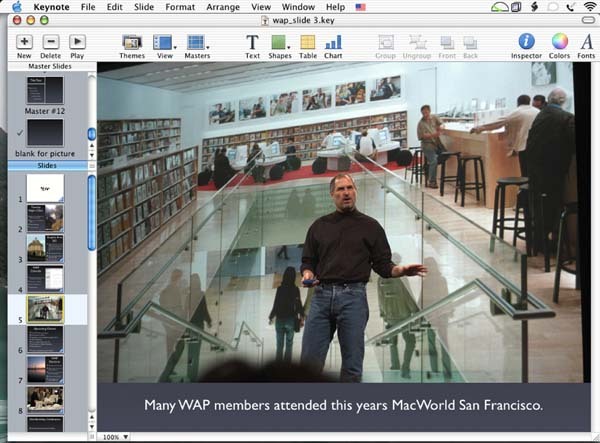 This Mac OS X-only application is designed to produce razor-sharp, crisp presentations that fully take advantage of Apple's outstanding Mac OS X technology, including advanced typography, QuickTime animations, precision layout, smooth transitions, and compatibility with Microsoft's presentation package, PowerPoint. 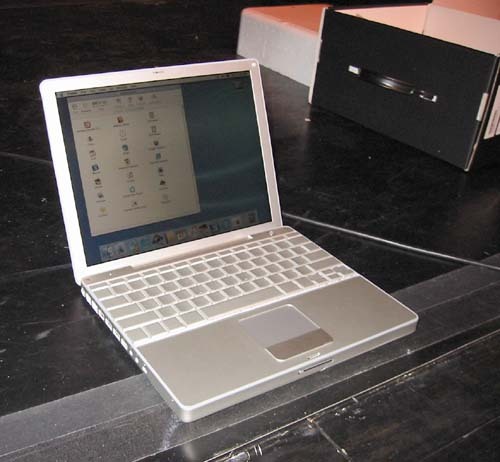 Brian then went on to talk about new hardware, specifically the very light 12-inch PowerBook G4 and the awesome 17-inch PowerBook G4. Sadly, he didn't actually have one of the 17-inch models to demonstrate, but he did have one of the new 12-inch models. Pulling it out of the shipping box, there was an audible gasp from the crowd at the size, followed immediately by suggestions that he give it away as a drawing prize. 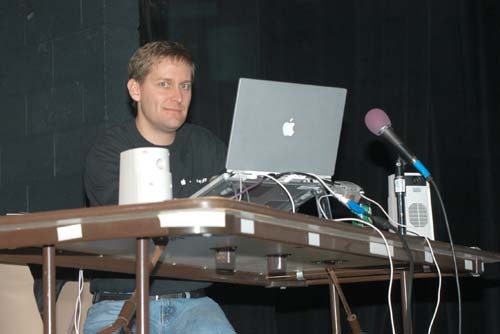 Brian looked a bit nervous, but managed to escape with the PowerBook still in custody. Probably the biggest surprise from Macworld was Safari, Apple's new Web browser. It isn't clear if Safari is intended as a true product or as a technology demonstration, but in either case it is an outstanding demonstration of Apple's strengths -- and is free, too. With an impressively crisp, clear and uncluttered interface, very quick page rendering, and crisp typography, Safari took an immediate lead as the fastest Web browser available for the Mac. Brian showed off some of the less obvious features, such as the option to turn off pop-up windows, and the ability to analyze page construction with the activity window. He also mentioned that Steve Jobs is reported to spend most of his time reading E-mail, browsing the Web, and doing presentations, and he can now do all three with Apple products: Apple Mail, Safari and Keynote. Rumors that Apple would start charging for iPhoto and iTunes proved to be false. On the other hand, there were new versions of iPhoto and iMovie, and these two applications plus iTunes can now be purchased as a bundle with iDVD as iLife, a set of integrated applications for Steve Jobs' "digital hub." All the pieces of iLife can be downloaded for free from Apple's Web site except iDVD, which is both impractically large and also explicitly requires a SuperDrive-equipped Mac. Brian could not demo the new iDVD, which was not yet available, but he did get advance copies of iPhoto 2 and iMovie 3. With mere minutes of experience using the new applications, he managed to show how they could be integrated with iTunes 3 to produce slide shows and QuickTime clips, complete with soundtracks selected from a user's iTunes music library. Interrupting his presentation several times to answer questions and investigate the new applications, Brian proved to be very responsive to the crowd. His dry, droll humor, mixed with understated enthusiasm, offered Pi members the best of Macworld San Francisco, only without the airfare or hotel bills.